Every business in every industry has unique requirements and goals that can benefit from custom web design services and a robust content management platform like PageFramer CMS. Our strategic partners consist of professional web design companies who have the expertise necessary to bring huge returns on your investment in today’s fast-paced, digitally-focused world. PageFramer is the best web content management system (CMS) available for any business looking to have an engaging and successful web presence. PageFramer combines the best features and attributes of open source and commercial CMS’s into a robust, reliable and secure platform. 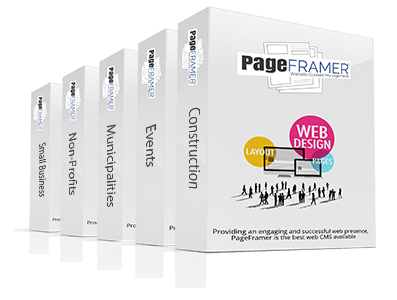 From competitive events, to municipalities/city governments and not-for-profit organizations, PageFramer can work for you. Learn more about the features that make it the best and easiest content management system available.